The City of Liberal Police Department Evidence Division will be liquidating a large assortment of items from the evidence storage. There is a large assortment of power tools, hand tools, various shop equipment, electronics of all sorts, toys and several “misc.” boxes that contain large assortments of all types of items such as knives, jewelry, collectibles, house hold items and much more. There is also 2 vehicles, close to 100 bicycles, small scooters, kids motor bikes, a kids ATV. There will also be large assortments of equipment and surplus items from other City of Liberal departments (street, parks, fire, etc.) 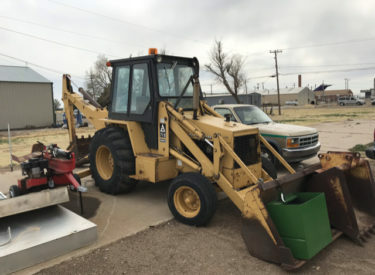 – Vehicles, mowers, backhoe, R-panel roofing, large assortment of lights, framing equipment, garage doors, office equipment, tools, street maintenance equipment, large assortments of misc. selections!! REMOVED THE DAY OF THE SALE. Announcements made day of sale take precedence over all prior announcements and printed material.